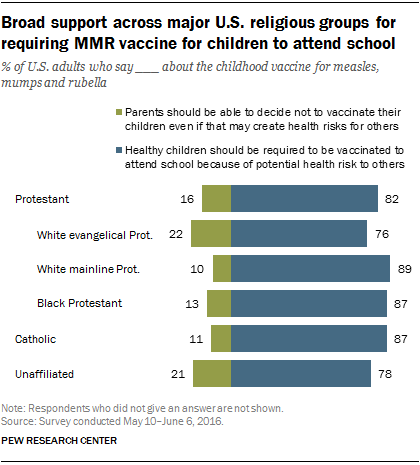 Large majorities of U.S. adults from all major religious groups say healthy children should be required to be vaccinated against measles, mumps and rubella to attend school because of the potential health risk to others when children are not vaccinated. Still, there are some modest differences between religious groups, a new Pew Research Center survey finds. White evangelical Protestants and religiously unaffiliated people are somewhat less likely than members of other religious groups to support a school-based MMR vaccine requirement, although about three-quarters of white evangelicals (76%) and religious “nones” (78%) do favor these requirements, according to the survey. About one-in-five white evangelical Protestants (22%) and unaffiliated (21%) say parents should be able to decide not to have their children vaccinated, a slightly higher share than for other religious groups. One-in-ten white mainline Protestants (10%) and nearly the same share of Catholics (11%), for instance, say parents should be able to decide not to have their children vaccinated for measles, mumps and rubella. Most white evangelicals identify as Republican or Republican-leaning, while most of the religiously unaffiliated are Democrats or lean to the Democratic Party. The survey finds Republicans and Democrats (including those who lean to either party) are about equally likely to support a school-based vaccine requirement. Public schools around the nation require children to have the MMR vaccine in order to attend school. All states allow exceptions for medical reasons, however, and 46 states specifically permit exceptions for religious reasons. No major religious groups are known to advocate against childhood vaccinations on the basis of doctrine. The modest differences by religious group in the new survey are generally in keeping with a 2014 Pew Research Center survey that asked a more general question about requiring childhood vaccines. There, too, a smaller majority of white evangelical Protestants favored requiring childhood vaccines compared with other groups. When it comes to the safety of the MMR vaccine, most major religious groups have similar beliefs. For example, 69% of Catholics, 73% of white evangelical Protestants and 82% of white mainline Protestants think the preventive health benefits of the MMR vaccine are high. 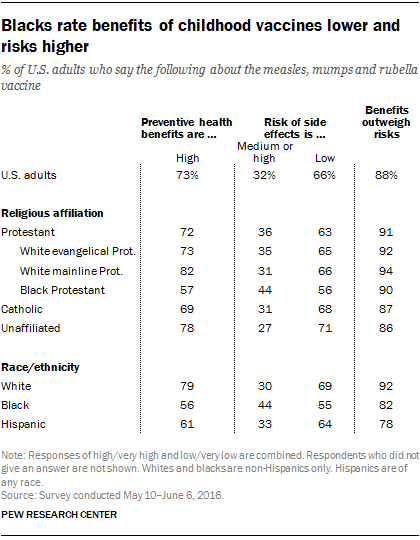 But a substantially smaller share of black Protestants (57%) say the preventive health benefits of the vaccine are high. Among blacks overall, 56% say the preventive health benefits from the MMR vaccine are high, compared with 79% of whites. Blacks (44%) are also more inclined than whites (30%) to say the risk of side effects from the MMR vaccine is medium or high.